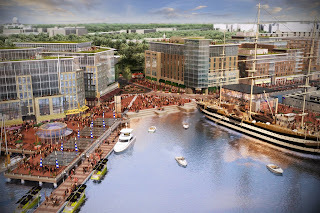 [DCMud] What can we expect from the Southwest Waterfront? The only other true counterpart it has at present is the Georgetown Waterfront. What will the comparisons be once it’s completed? SO: Well, one thing we learned from Stan [Eckstut] about waterfronts is how important the water actually is. You need to have a plan for the water too, and not just focus on the land side of things. MB: What happens on the water totally influences the rest of the project. I think the general feeling is DC doesn’t have, outside of the Washington Harbor, a place where the city comes right to the water. If you think about [it], most of Georgetown pulls back and places like the Navy Yard never really went right to the water and, for years, were industrial. And, of course, the Anacostia is silted up and never became a great port. If you go back and look at the L’Enfant plan for the city, people were originally going to come by water and then travel by canals, so it was going to be a waterfront city. It never really happened that way and the idea is to finally bring the city to the water with people living there, working there, hotels, retail, restaurants and all different kinds of activity. [DCMud] How do you go about integrating those original L’Enfant designs into your plans for a modern development? MB: We base all of our work on what works in other places, so we spend a lot of time looking at precedents. We feel very strongly that great places are made by looking at other places, taking those ideas and using them as a basis for new ideas. I don’t think necessarily we’re trying to reinvent; rather, we’re taking the best of what you have at other waterfronts across the world and trying to make something that’s unique for DC. 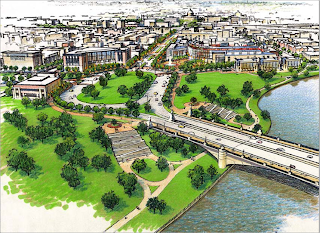 The L’Enfant plan is one aspect of that, but there are other ideas and other places as well. There’s an idea to connect to the Mall along th Street, there’s an idea to make Maine Avenue a vibrant place with active waterfront uses that ties in the existing fish market in a creative way. In the coming years, the Southwest waterfront will transform into a glittering $1.5 billion development with three new hotels, condos, and a bustling promenade overlooking Hains Point. But until then, locals can take in the old scenery: the garish Maine Avenue Fish Market, boring anchor sculptures, empty wooden benches, and a strip of boxy seafood restaurants and clubs, including the now-closed D.C. hotspot and drama magnet, H20. The new restaurant plans to open this spring and is located at 800 Water Street. By the way, those wooden benches aren't always empty...below is a photo I took on a beautiful Sunday afternoon (it was 67 degrees yesterday!) with those wooden benches along the waterfront promenade getting some use.